Hillary Clinton was so confident of victory last year that she bought a second house next to her residence in Chappaqua, New York, to accommodate White House staff during presidential retreats there. "I thought I was going to win," she said. The New York Post reported last year on the Clintons paying $1.16 million for the three-bedroom, ranch-style home next to their house in Chappaqua. The newspaper's source said at the time it was thought to be a weekend retreat for their daughter Chelsea's family. 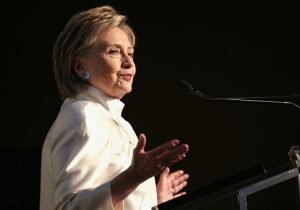 In an interview from her home on the CBS program "Sunday Morning" delving into her 2016 election defeat, Clinton was asked about the property after she discussed attending President Donald Trump's inauguration. Host Jane Pauley noted Clinton had been "so sure" she would be the one giving the inaugural address in January. "You specifically bought this house for a reason," Pauley said as they walked outside. "And this was to be?" Pauley asked. "Well, I know a lot about what it takes to move a president, and I thought I was going to win," Clinton said. "The Clintons had acquired the house next door to accommodate White House staff and security during a second Clinton administration," Pauley narrated. Pauley asked Clinton if that decision haunted her. "No, I'm very happy we did it," Clinton said.